When Pep Hamilton had his opening conference call upon being named the Colts offensive coordinator, he made one thing clear. West coast or no coast, the ball would be finding the hands of the Colts playmakers. This was evident on Sunday night with Darrius Heyward-Bey being a frequent recipient of quick passes. Getting DHB comfortable and confident in this offense will be something to watch moving forward and Sunday was certainly a step in the right direction. On several occasions, DHB hauled in short passes down the line of scrimmage and turned them into gains of nine and seven yards. “You see those quick throws out to the wide outs, they are actually called runs, but they are loading the box up, putting eight, nine, 10 guys up there to stop the run,” Head Coach Chuck Pagano said after the game. 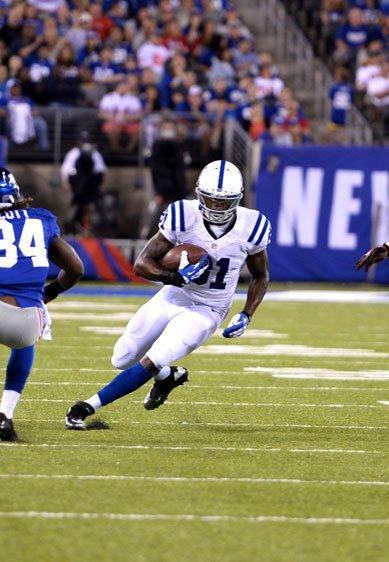 DHB caught a total of four catches for 42 yards against the Giants and showed an ability to rack up yards after catch. With DHB back from a knee injury and having an up and down end to training camp, quarterback Andrew Luck wanted to find his new receiver early on Sunday night. Almost a half year later, Luck is speaking the same language that his offensive coordinator did back in the winter. The playmakers and balance at the skill positions are there, now it’s time to accentuate that. It was fun to see the colts bounce back and have a complete game and the reserves “finishing” the game! We all know it’s preseason and it doesn’t affect the win/loss column but it does affect the locker room! It builds a trust in what you are doing and to each other, keeping the players accountable to each other and add a little swagger to their step. As far as the regular season Can’t wait… I’m very hopeful for the men they brought aboard and I’m going to feel sad to see the different hard choices coming down the pike in a few weeks. Love all of the guys on the team, good luck men and I really mean that! I’m proud of you guys… Go Colts all the way!!! !